STARSHOP Alcatel idol-3 kickstand case is the enduring 360 degree protective casing for your Alcatel idol 3 Smartphone. It has the attached kickstand which can help you can stand the cell on table while watching any video. The anti-slip and tough body is double in layer such as middle impact resistance layer and rubberized outer and inner layer. When your cell phone falls accidentally, then don’t get hyper or worried as this protective casing will shield the phone from abrasion. 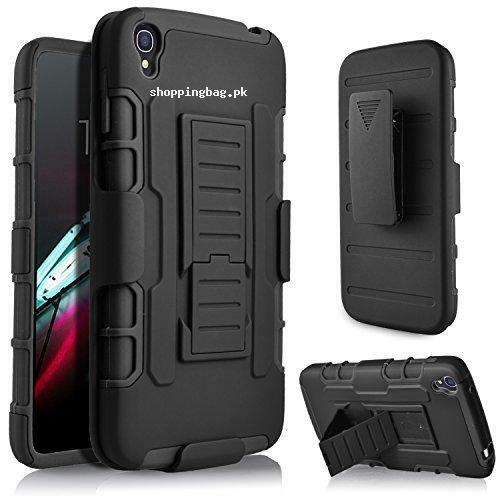 The case is accompanied by holster belt clip so you can carry the cell phone with you anywhere. As it is the 360 protection kit so you also get screen protector for Alcatel idol 3 in a pack of STARSHOP Alcatel idol 3 kickstand case in Pakistan. Get the best STARSHOP Alcatel idol 3 kickstand case price in Pakistan from the service of Amazon online shopping in Pakistan and buy the Amazon products at reasonable price. You will get the product at any of your places, at your doorstep with the highly demanded service of cash on delivery. Keep your high technology phone protected from risk of damages with the durable casing which you can find from inventory of Amazon imported products in Pakistan. Starshop @ is a registered trademark protected by US Trademark Law. All products are ship from US, we only import from well know manufactures and inspect all our product before they ship out to make sure only good quality deliver to our customer. This dual layer 3 in 1 kickstand come with belt clip holster, hard polycarbonate plastic shell on soft, flexible silicon skin that amazingly against drops that will shatter screen.